It's Tuesday, and time for a new challenge at Crafty Sentiments Challenge Blog. This week, the theme is 'Glitter'. Everyone likes a little glitter, right? This is an easy one! I colored Isobel - Take Me to the Ball with Copic markers, then added some gold Stickles glitter glue to her crown. The sentiment was computer generated. The card was constructed using Lawn Fawn dies, papers from Close To My Heart, and ribbon from 3 Girl JAM. 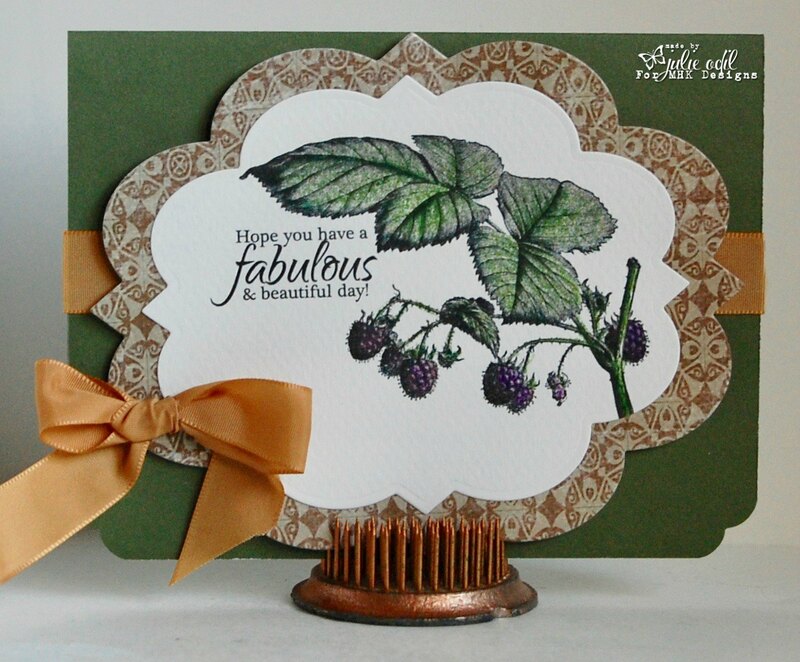 I hope you join in on the Glitter challenge this week at Crafty Sentiments Designs. We've got great prizes each week, and I'd love to see what you make! Is this really Black Friday? Did I really eat all that turkey yesterday? How can we be a month from Christmas? Oh my, oh my, oh my! 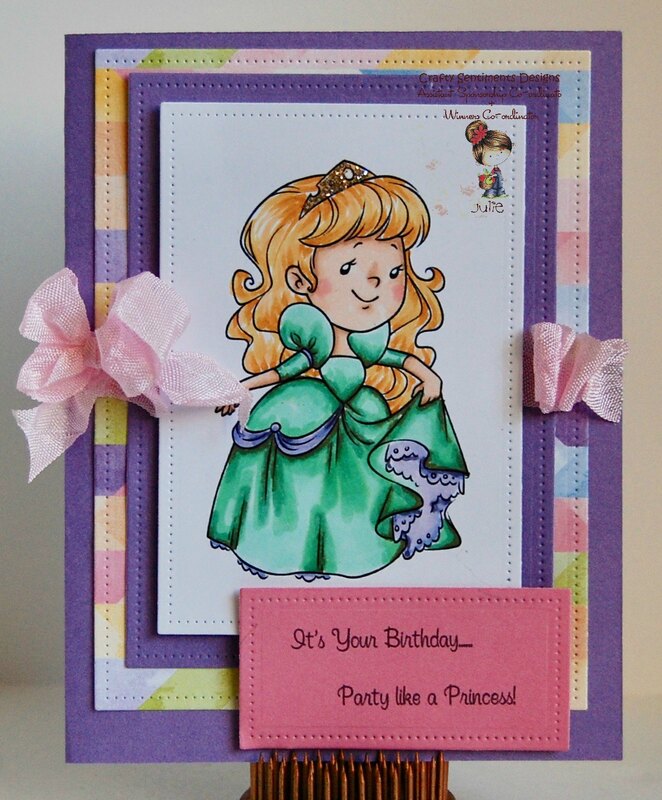 I'm posting today for Great Impressions Stamps, and I'm revisiting a favorite project from the past. Since it is just one month to the day until Christmas, I'm featuring one of my favorite Christmas cards today, with one of my favorite Great Impressions Stamps on it. I love this chickadee (G28)! It's Monday, and time for a little mid-month inspiration at the Path of Positivity Challenge Blog. The challenges are month long, and this month's theme is 'Appreciation'. I think this is a great theme for the month of Thanksgiving (at least here in the U.S.)! All I needed to complete the card were Spellbinders dies for the shape and a bit of crinkle ribbon. A Day For Daisies is one of our wonderful sponsors this month. 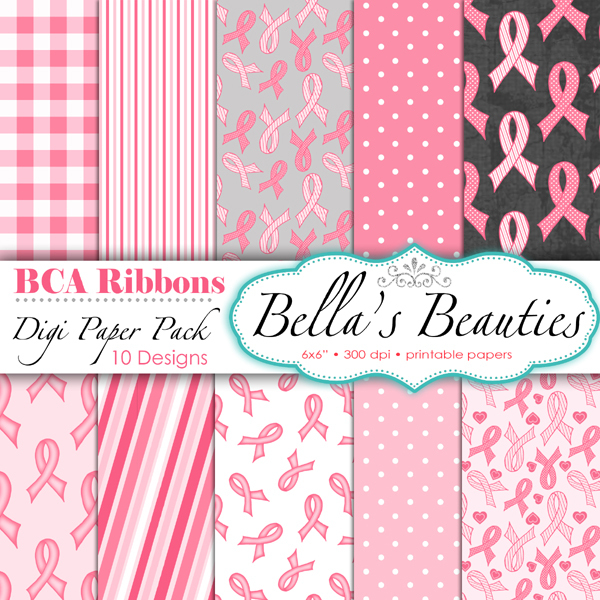 One lucky challenge entry will get a $12 gift certificate to the Day For Daisies Store. Kitten Scraps is our other guest sponsor. One lucky challenge winner will get a $20 gift certificate to the Kitten Scraps store. 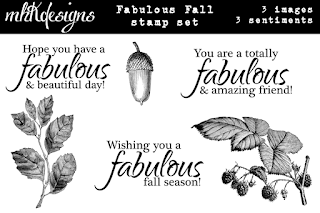 Thanks, also to our regular sponsors, Creative Bug Digital Stamps & Decosse's Dynamite Doodles. I hope you can join in on our 'Appreciation' themed challenge this month at Path of Positivity. It goes until Dec. 4, so there's plenty of time to link up! Happy Monday, everyone! A week ago today, I had my first chemo treatment. Two weeks off, and I'll have another. Interesting changes, this chemo makes in your body, but I'm plugging on! Today starts a new challenge at MHKDesigns. The Nov/December challenge is now underway. 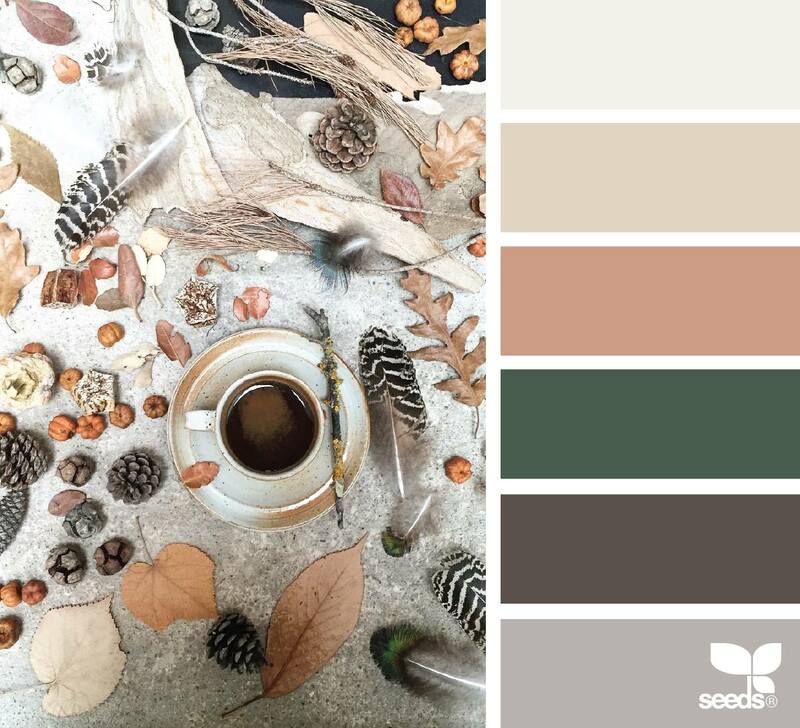 There's an inspiration board you can use, or, if you use an MHKDesigns image, it's Anything Goes!!! 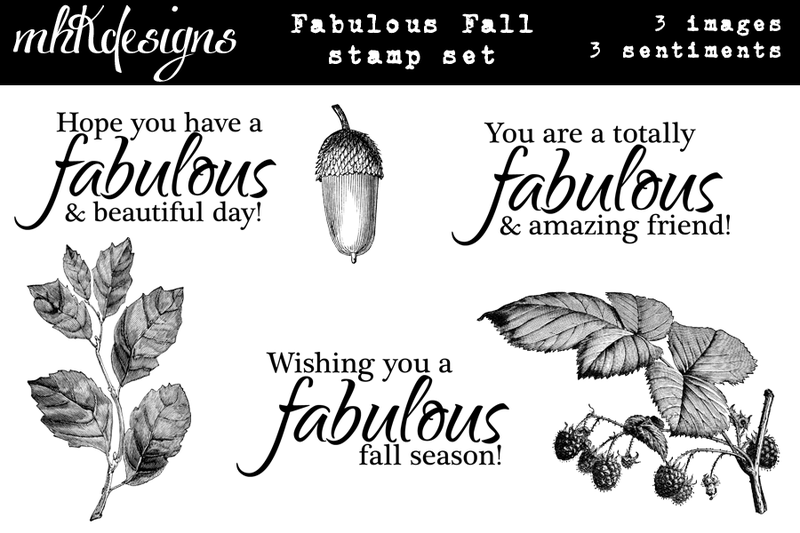 I hope you join us this month at MHKDesigns! I'd love to see what you make! It's time for a bit of mid-month inspiration over at the Imagine That! Creative Playground. Have you found time to play along yet? This month's challenge goes until December 2, and the theme is - Christmas is Coming! And, yes, it is! Waaaaay faster than I'm ready for this year. Uff dah! This card uses Imagine That! Digistamp Christmas Bird Trio (there are several sentiment options to choose from, and one without a sentiment at all, if you prefer), and Bella's Beauties Merry & Bright Digital Papers. I colored the Christmas Bird Trio with Copic markers, then used some Icicle and gold Stickles on them to sparkle them up a bit. 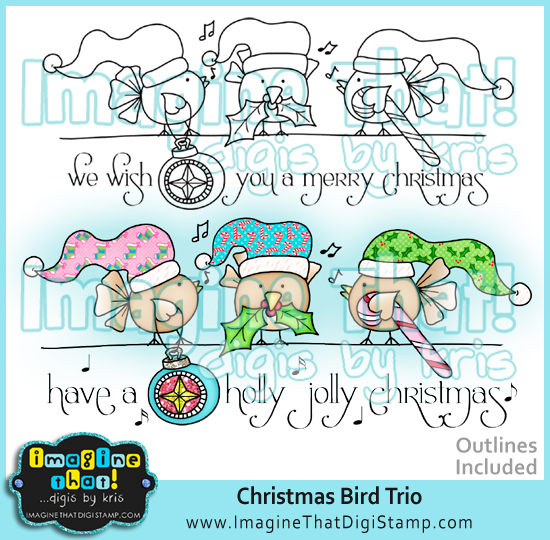 I printed the Christmas Bird Trio 3 more times onto Merry & Bright Digital Papers, fussy cutting their hats, and glueing them on their heads. A spot of red ribbon, and the card is DONE! Yea! Add it to the stash. Hey, I have to start thinking about mailing these Christmas cards out soon, don't I? Geesh! Come join the Christmas card fun at the Imagine That! Creative Playground. Link up those Christmas cards! You have until December 2. Happy Friday, everyone! It's almost the weekend! Here in Northwest Wisconsin where I live, deer hunting starts tomorrow. It's nearly a sacred event around these parts. Life comes to a screeching halt for 9 days while the hunters descend on the woods and the deer try to figure out what the heck happened! I stay in town and keep the dog close to my side. Papers for the card are by Echo Park. 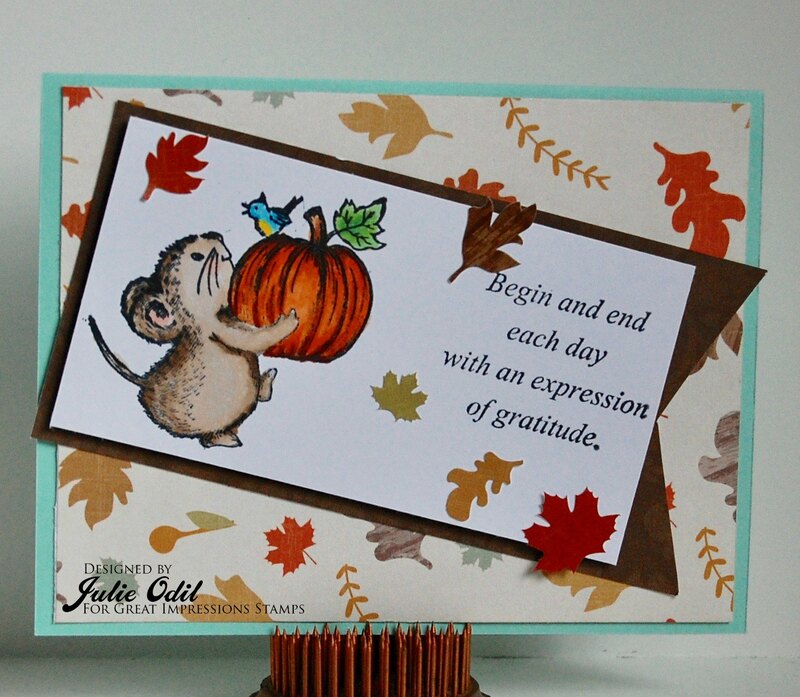 The leaves are cut out with a die by Sizzix. The banner die was won in some blog candy (don't know the brand). Circle dies are by Lifestyle Crafts. It's Tuesday, and time for a new challenge on the Crafty Sentiments Challenge blog. Our challenges are weekly. 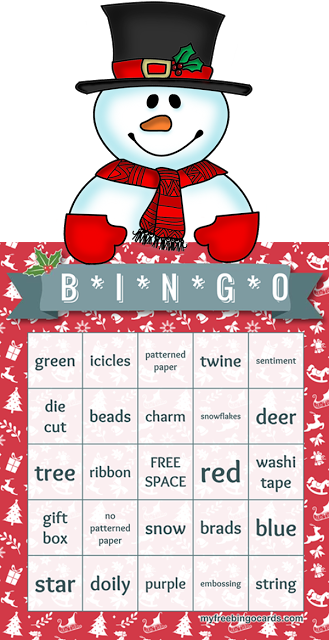 This week, the theme is Snowflakes. 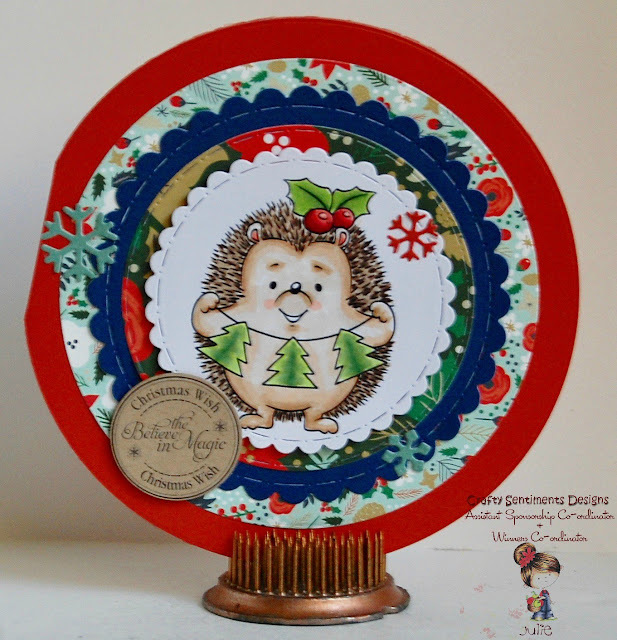 I colored Hedgehog - Christmas Tree with Copic markers. The sentiment, also from Crafty Sentiments Designs, is from the Christmas Circles digital set. Papers for this card are from Echo Park. 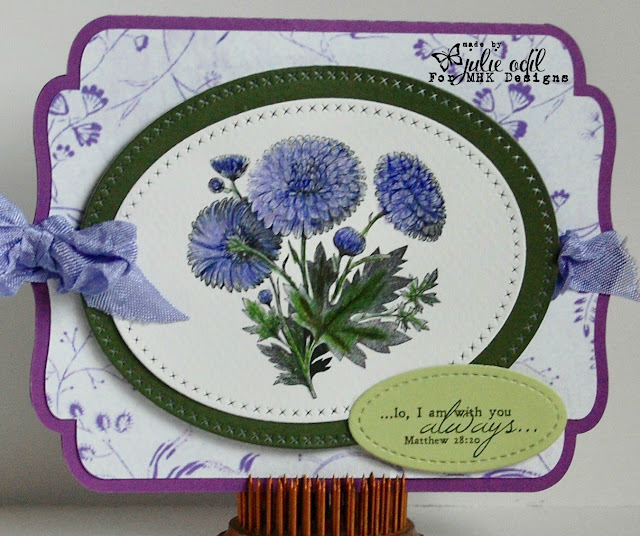 A variety of circle dies were used to create the card from Lifestyle Crafts and Craftin' Desert Divas. The snowflake dies are from Hot Off the Press. 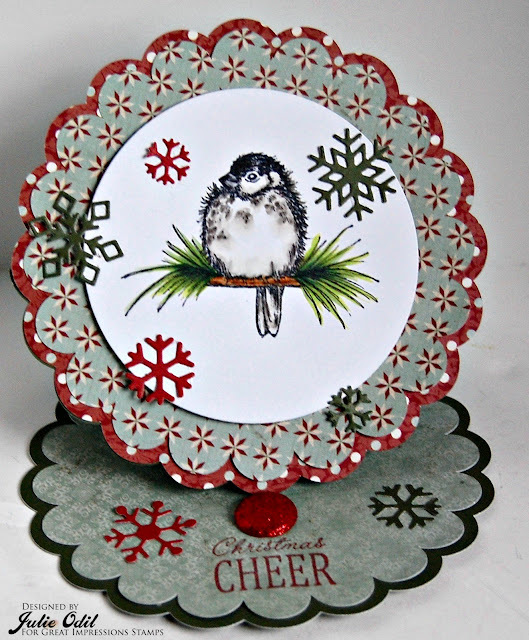 I hope you can join us this week at Crafty Sentiments Challenges for our Snowflake challenge. I'd love to see what you make, and we have great prizes for you to win! Hello, crafty friends! It has been quite a week. As some of you know, I have recently been diagnosed with Lymphoma. I finally got to see an oncologist this week. It has been a whirlwind --having even more tests, a minor surgical procedure to get a port put in, some training done, and everything ready to begin chemotherapy. I'm ready! Let's beat this! 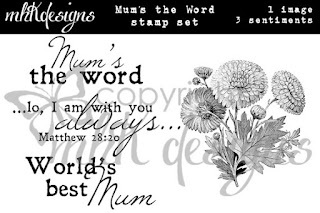 I used the beautiful MHKDesigns set, Mum's the Word on this card. 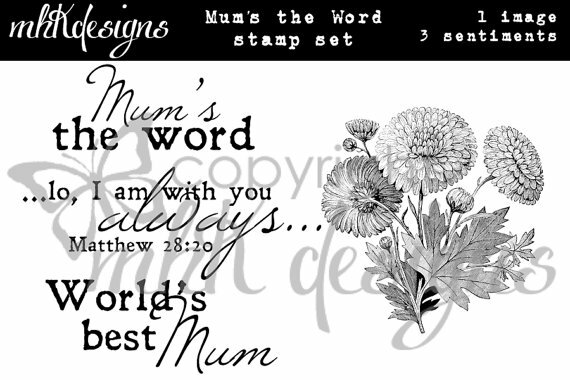 Taking the mum image from the Mum digital stamp set, I colored it with Lyra Rembrandt color pencils. 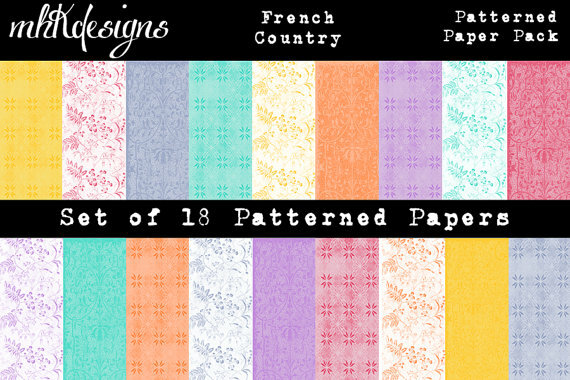 Background papers, also from MHKDesigns, are French Country. I seem to use these papers often. They are beautiful for flowers, and I do love to color flowers! 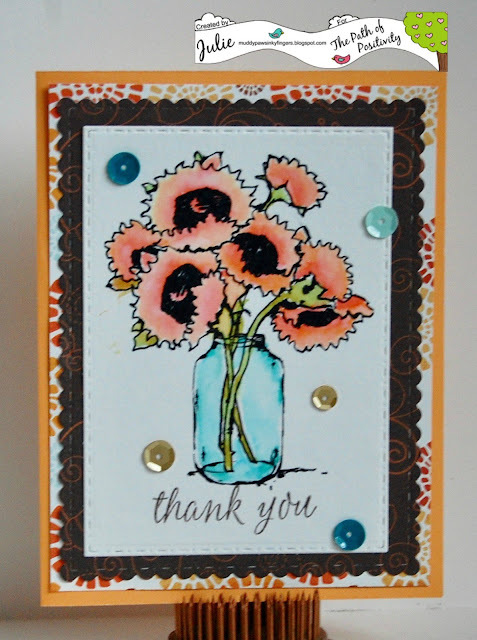 I cut the card base out on my Silhouette Cameo, and used some stitched oval dies from Die-namics to complete the card. The crinkle ribbon is from 3 Girl JAM. You'll find these and many more beautiful digital sets in the MHKDesigns Etsy Store. 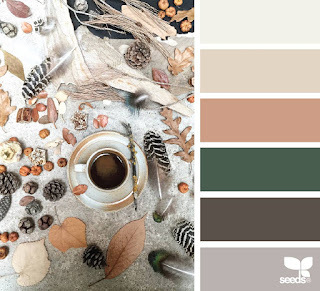 There's a challenge going on on the MHKDesigns blog, and tons of inspiration on the blog, too. Lastly, there's an MHKDesigners & Friends Facebook group you don't want to miss for even more inspiration and news! It's Friday (yea!) and I'm posting today for Great Impressions Stamps. It always makes me happy to play with my favorite stamps! This is Veteran's Day. I thank all the Veterans out there for serving our country. We owe you our respect and much more. 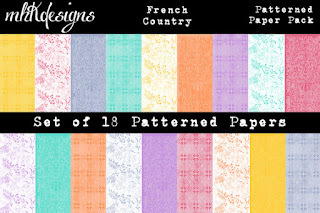 Papers and leaf stickers are from Photo Play. The card stock base is from Close To My Heart. It's Monday, and time to start a new challenge at the Path of Positivity Challenge Blog. The challenges are month long, and this month's theme is 'Appreciation'. I think this is a great theme for the month of Thanksgiving (at least here in the U.S.)! I used watercolor paints on this card, and a sentiment from Simon Says Stamp. Papers are from Echo Park. The sequins are from Close To My Heart. 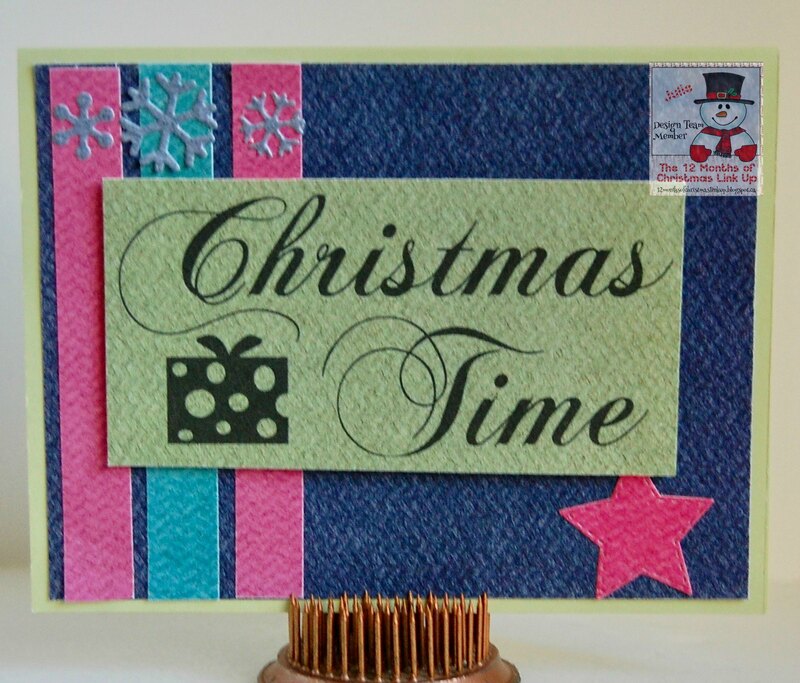 I used some stitched edger dies by Simon Says Stamp on the bottom of the different paper layers. 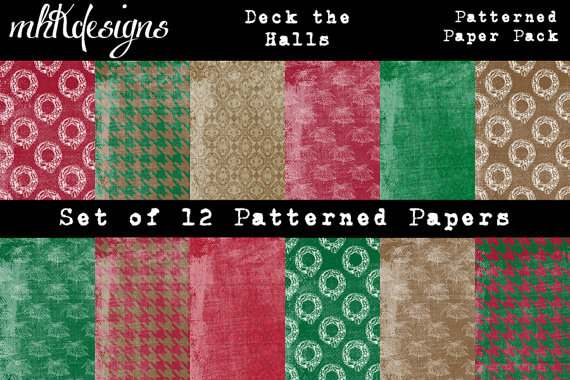 Papers are from Echo Park -- the Deck the Halls 6x6 paper pad. I made the gold snowflakes with glitter paper from Close To My Heart and Cheery Lynn dies. Hello, and happy Thursday! It's been a week now that I've known, and a few weeks that I've suspected. Last Thursday, I was diagnosed with Lymphoma. I've had swollen lymph nodes for a few weeks now, and have been undergoing tests. I've had some other symptoms, too, including incredible fatigue. I wasn't surprised by the news. 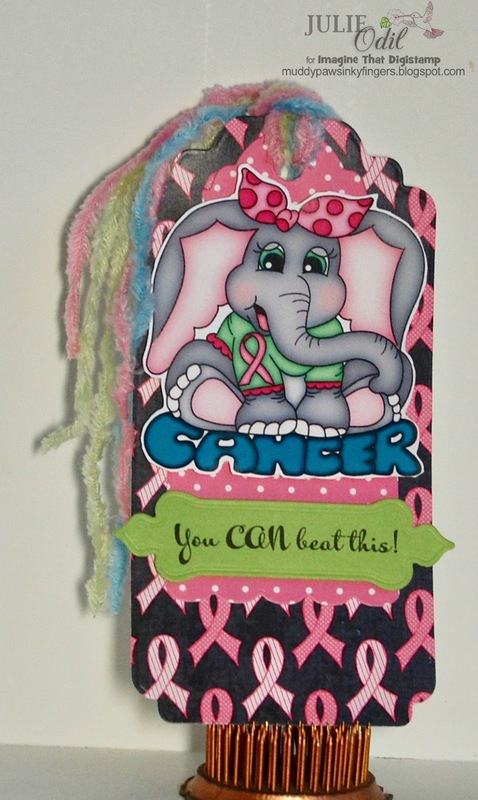 I made this tag to use for my own inspiration. I have it sitting right by my computer. It's one of the things that will help me get through this. Mostly though, it will be my faith, my family, and my friends. 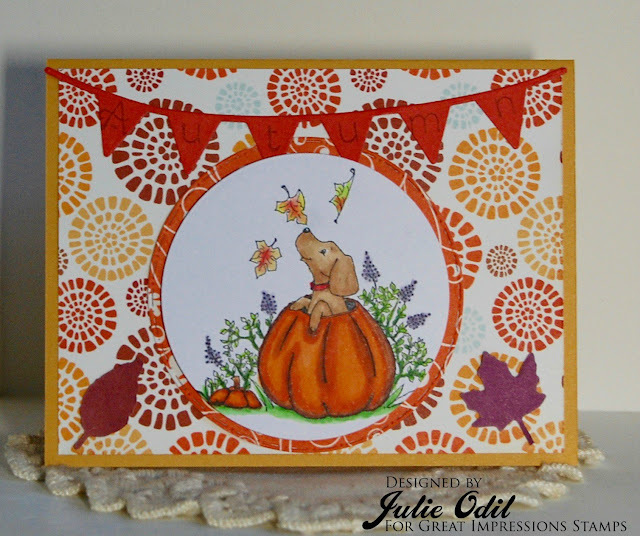 This tag uses the adorable set from Imagine That! Digistamp called Let's Squash Cancer. I used the pre-colored digi and one of the sentiments from the set on this. If you are the praying type, I'd love prayers. I believe they will help me along on this journey. My guess is I'll be blogging less in the month's ahead, but I'll try to bring you along on this journey, if I can. November? Already? I'm sure glad I've been whittling away on my Christmas cards month-by-month this year! Being on the DT for The 12 Months of Christmas has kept me on track! You can link up any Christmas card you make. 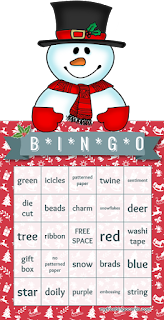 To qualify for the prizes from our sponsor, follow the bingo theme using the chart above. I used the diagonal line Star- No patterned paper - Free Space - Snowflakes - Sentiment. Our sponsor this month is Decosse's Dynamite Doodles. 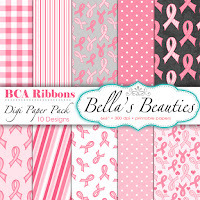 Lisa designs all sorts of gorgeous papers and elements. 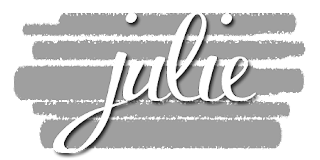 Her blog is worth a visit, for sure! 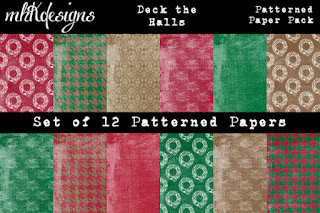 The Yuletide Texture papers on this card were created by Lisa for this month's challenge. The sentiment is also created by Decosse's Dynamite Doodles. The snowflakes are dies by Lawn Fawn. The star is a die by Top Dog dies. I hope you join us this month at the 12 Months of Christmas Link Up. You have all month, and Christmas is coming fast! 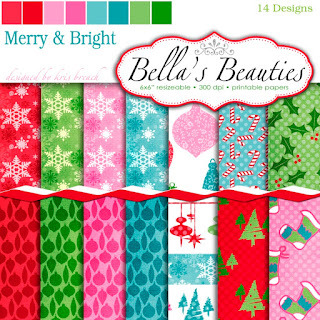 It's Tuesday, and time for a new challenge at Crafty Sentiments Designs. I'm the hostess this week, and it's also the first day of this month's New Releases. I colored rubber stamp, Dragon Charlie - Taking a Nap, with Zig Clean Color Real Brush Pens and a paint brush. I cut the rocking card shape out on my Silhouette Cameo with a file found in the Silhouette Design Store. Papers are from My Mind's Eye. The sentiment is from Craftin' Desert Divas. This week's challenge is Anything Goes. 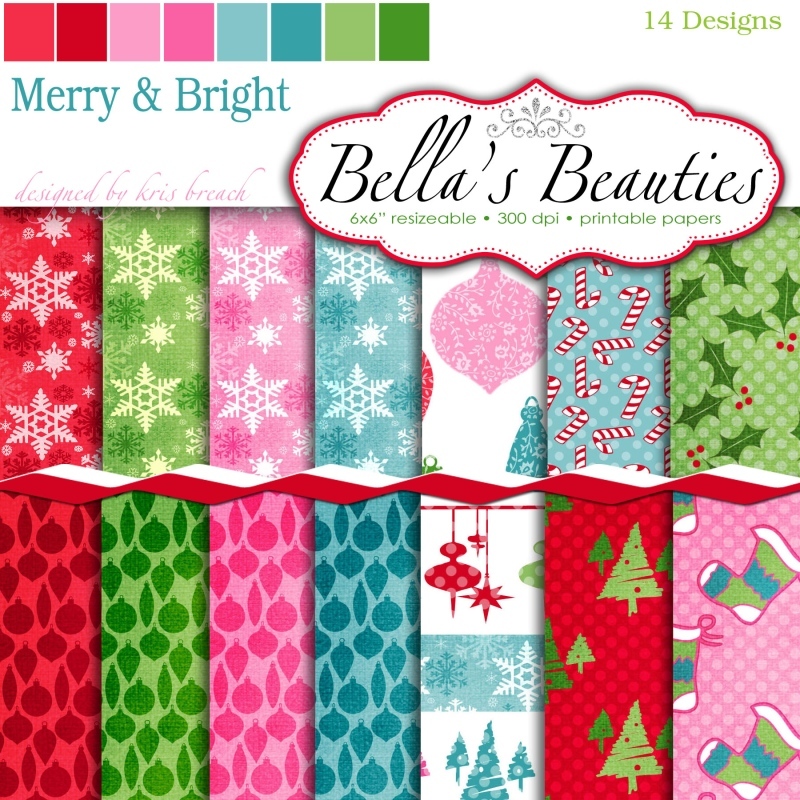 I hope you can join us at Crafty Sentiments Designs!